Last night as our family gathered to pray together we spoke about how today, November 16, 2011 was going to mark a year’s time on Gladney’s wait list, waiting to be matched with a child we don’t know yet but are already in love with, if that makes any sense. A baby girl whom we pray for, and hope for, whose face we have not seen, whose story we don’t yet know. A tiny girl a world away whom we look forward to joining our family someday. But who, until she does, has become known around our home simply as “Little Sister”. Last night some tears were shed as we realized a full year of being on the wait list had gone by, and that we are still here, still waiting, not completely sure how or when this process will ultimately play out. Reaching the one year mark on the wait list was never really on anyone’s mind until the recent slowdown and changes in process in Ethiopia, and subsequent delays in referrals, court processing, and Embassy approvals for many adoptions. When we began the process with Gladney back in April of 2010 the timeline for an Ethiopian adoption was very different than it is now. Once we achieved the monumental milestone of being approved to adopt, and having our dossier reach Ethiopia in mid-November of 2010, we felt pretty confident that we’d be celebrating this 2011 Thanksgiving and Christmas with another little Horne around our table. Of course that has not happened, and we continue to wait. To hope. And to pray. That God has his hand upon this little girl, wherever she is. That He is being her provider, since we cannot yet be. That He is loving her and giving her comfort, since that is not yet ours to give. And truly, while we wait, we see God’s hand and mercy upon our family in ways we did not imagine. While I am not saying that I think it’s good for children who are orphaned to have to wait longer for families, I do believe that God has given us the blessing of knowing the wait has been fruitful for our family, and I am grateful for that. I have had the privilege of watching my children become a little more aware of the plight of millions of orphans around the world. I have seen their eyes shed tears over the pain so many kids their own age face on a daily basis. I have seen them grow in compassion. I have seen their hearts become a little more tender to the things that truly matter in this world. Oh sure, they are still normal, selfish kids — aren’t we all?? Who wallow in wealth and struggle with contentment despite having so much — don’t we all?? Who complain mightily about the blessings they enjoy freely — and yes, I could be writing these lines about myself and not my children…but isn’t that the point? I have to believe that wherever our daughter is, and whatever circumstances she is in, that at this time, our stories are not ready to cross paths. But that when it is time, that God will orchestrate events beautifully, and we will know with certainty that His timing is perfect. We really, really look forward to the day that we will finally get to see her face, to hear her story. To welcome her into our family and to shower her with all the love we know how to give. All the faith in the world doesn’t mean the waiting isn’t hard…it is hard. And it may get harder before we are all done. I said I was interrupting the Thankful Posts and I am. But today, I want to leave you with this picture that came across my Google feed after a recent search on the text “In everything give thanks…”. 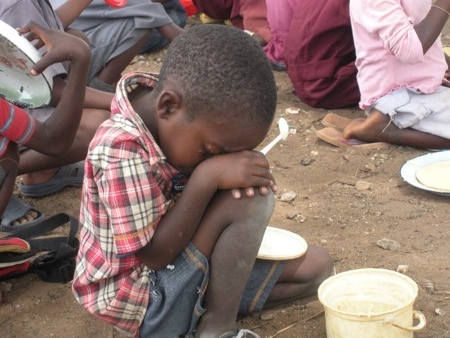 This little boy actually resides not in Ethiopia, but in Zimbabwe. I cannot get this picture out of my head. Nor can I think of a more appropriate reminder for me and my family as we contemplate what it is to give thanks.